While giving your guest a tour of your beautiful home you might not show them your bathroom. However, the bathroom in the above image gives you a million reasons to flaunt. 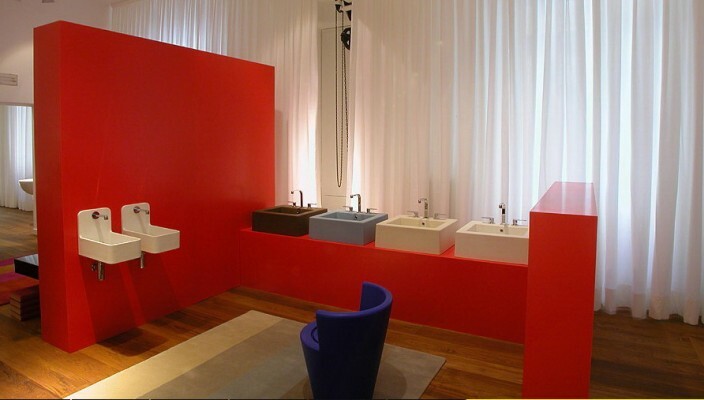 The red walls are a very bold choice of color for a bathroom but they are giving the complete atmosphere a modern and fresh look. The wooden floor is a classic contrast with the blood red walls. All the bathroom wares are of modern designs and different colors but are blending together with the floor and walls very nicely. The purple chair in the center makes the room a luxury to bathe in. The white curtains at the back are brightening up the space. Although the dimensions of the room are divided in different proportions the place is quite lavish. Red is a color with high risk until used properly but this room is surely a delight.